Here I sit in Constanta, Romania, on a park bench, facing east and looking out at the Black Sea. This is the absolute last place I could decide between a northern (Siberia, Mongolia) route and a southern (Turkey, ‘Stans) route. But I have already chosen north, my original plan. Reasons include visa simplicity and the fact that most of you who responded voted north. The climate was a factor, too. North will be largely cloudy and rainy, the south sunny and dry. It is only April but sunburn is a problem. I’ll still have deserts to cross in Mongolia, 500 miles instead of 2000 miles on the southern route. But if I am suffering from sunburn already…I think my mind is stronger against rain and mosquitos than my body is against sunburn. Romanian friendliness and openness continues to impress me. The towns and villages changed character somewhat as I traveled east, more stores and little bars. In the evening people like to sit on little benches or stools, or on the curb or ground, in front of their homes, outside of their fences and gates, by the sidewalk and highway. I find this interesting: behind their walls and gates I see very nice gardens and yards where they could enjoy the evening in a quieter, more private place, but they choose to be out where people are, gathering in little family groups or bunches of older men, women, or teens. 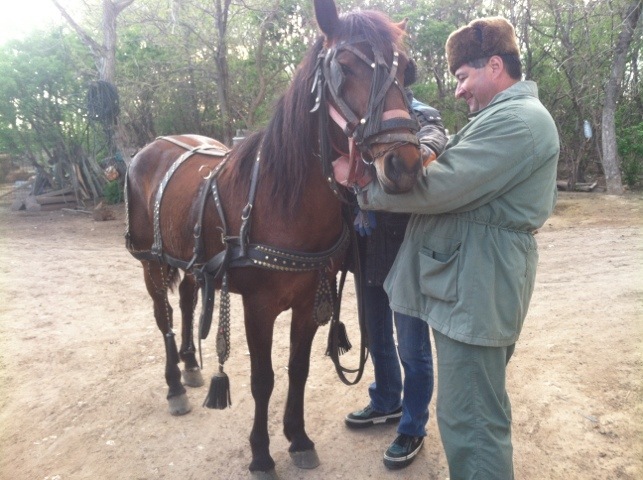 The Fedora is popular headwear, even for farmers in horse-drawn wagons. Little old ladies (Babushkas in my American slang, a Russian word not to the Romanians’ liking) have a standard outfit: black dress to below the knees, black stockings, big shoes, a bulky dark sweater or jacket, and a head scarf. Sometimes a dark-colored apron. They all appear to be seventy years old but a closer look reveals they are between 35 and 100. Younger women wear tight pants and modern clothing, and not all women over 35 are Babushkas. In groups of three or four I see them carrying rakes and hoes out of the village in the morning, back in the evening, with a food basket. Often they and their menfolk are seen gathering dandelion greens, lamb’s quarters and other edibles, or grass and clover for the fowl. They also gather snails for eating. The last week has been full of experiences in Romania. This is a beautiful country full of friendly, real, vital people making good lives in very hard economic conditions. They don’t hesitate to smile and engage. They are proud of their well-deserved reputation for hospitality. After my last dispatch from Craiova, on Orthodox Easter, I learned that the holiday is celebrated for three or four more days. An outdoor party at an agricultural co-op drew me in. A fiddler and accordion player (clearly farmers in their best clothes) were surrounded by a ring of dancers of all ages, their arms joined, making their way clockwise with steps resembling Country Western line dancing. A man came around with cups, filling them with Pepsi. A woman re-filled mine with beer. Next was something stronger from a Pepsi bottle. A little old lady came round dispensing bags from a basket; mine contained two hard-boiled eggs, a chocolate bar, tiny home-made fruit pastries, and some hard candies. The tradition with the eggs: find a partner: hold your egg out pointy end up; he or she taps your egg with his. The egg that cracks is given to the owner of the intact egg. I had four wins, my eggs lined up on my hat brim on my bike. I joined some men in discussion at the well; a short, sharp, powerfully built farmer translated for me. Some wished for a return to communism, when every family in town had a similar level of prosperity, no man or boy was unemployed, ever, and crime was rare (even if that prosperity level was pretty low, and there was little choice at the grocery stores or in careers). Others preferred today’s freedoms, abundant consumer goods, and the chance to at least try, by working harder or more cleverly, to earn more money (even if there was high unemployment, especially among the young, more crime, and many families in town struggled through extreme poverty while a very few farmers drove BMWs and vacationed in Western Europe). I’m sure glad they didn’t ask my opinion. I took my eggs and left after shaking thirty hands and kissing a bunch of cheeks. Bound for Bucharest, I missed a turn. I took a side road to get back on course, and then missed another turn. Fifteen miles of back roads were required to avoid backtracking. The dirt road villages I encountered were tiny, isolated and poor. I started to set up behind a very small church at sundown. 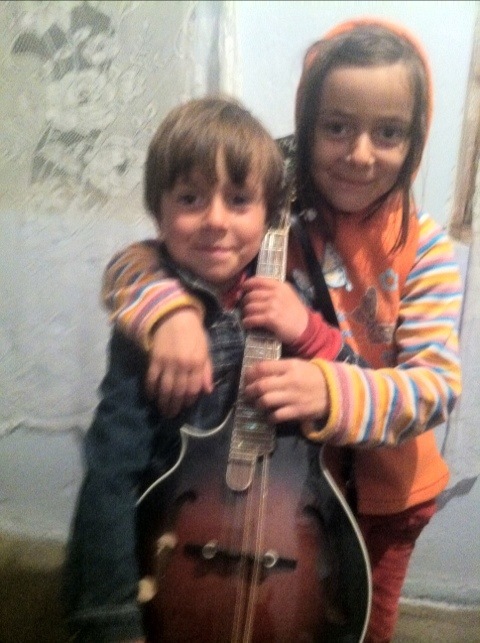 A charming little girl tried to help, then brought me to her house next door, a house with few comforts and no English. Dad and Uncle, already half drunk, insisted that I eat and sleep there. I should have refused. Mom and kids were charming and hospitable, and dad and uncle were too, at first. But after much beer and many eggs, they brought out the whiskey, and things went downhill from there. They demanded louder, faster music from me, kissed my cheeks when they got it (eww! ), cursed and spit on the floor when they didn’t. They showed their me their tattoos and scars, screamed at the wife, threatened and scared the kids, laughed and cried and pounded on the table. At 1:00AM I demanded sleep, climbing onto the couch on the porch. They insisted that I sleep in the main bedroom (none too clean, a rug for a sheet on a high, soft bed), over the wife’s loud objections. A high volume argument ensued outside the door. A half hour later the dad and uncle woke me, loudly demanding more music. I yelled back louder and they apologized in a whisper, tiptoed out, and had a screaming argument in the hall. An hour later this scene was repeated exactly. At 4:00AM or thereabouts, they came in again with a big, burley policeman, a constable he called himself, with a stern look and a hand on his gun. I put on my glasses and greeted him from under the covers. He shined a light around, then asked, “Are you American?” Yes. “Are you a prisoner here?” No. “Are you sleeping in this house?” Trying. He turned and glared at the drunks, ordered them out of the room. Then he took off his hat and said, “May I ask permission to shake your hand?” I stuck my hand out from under the covers and we shook. It hurt. “You are free to go,” he said. He went out in the hall and chewed the men out viciously. They didn’t make a sound, but the wife argued loudly with the policeman. After he left, the wife moved me to the couch on the porch, after much pantomime and confusion, because I thought she was kicking me out of the house and so I refused to get out from under the covers. She tugged, I held tight. A half hour later the roosters started crowing about three feet from my head . Before the sun was up, the drunk uncle was poking me saying, “Kaffe? Kaffe?” It made him sad when I refused coffee, tea, beer and whiskey. I ate a hard-boiled egg and was on the road by 7:15. I hope these two darling, left-handed girls survive their upbringing. That day in Caracal I met Andrei and Florentina at the grocery store. 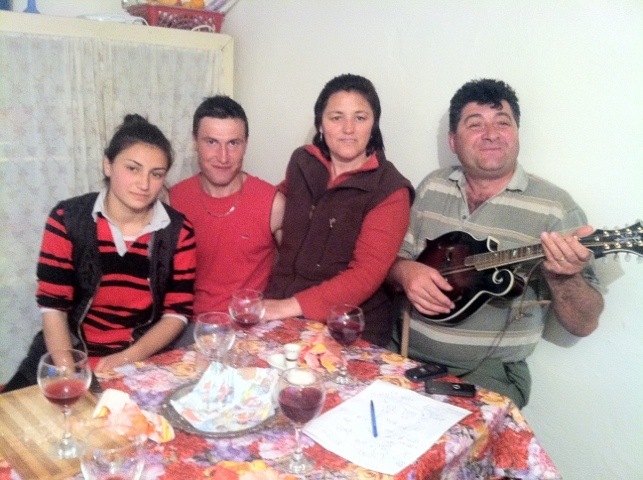 They are 30, from Constanta, 240 kilometers distant, visiting Florentina’s Mom for the holiday. Tea with Mom, lunch with Auntie, a tour of the gardens; it was most pleasant. They described Constanta, on the Black Sea, and invited me to visit a few days later. I envisioned the Jersey shore and accepted their invitation. Rainy weather followed me for a few days. After a soggy camp I was watching the weather move (big sky country) and took shelter at a little village grocery just before a violent rain and hail storm. They were quite hospitable; soon I was seated and drinking home-made wine, sweet and strong. 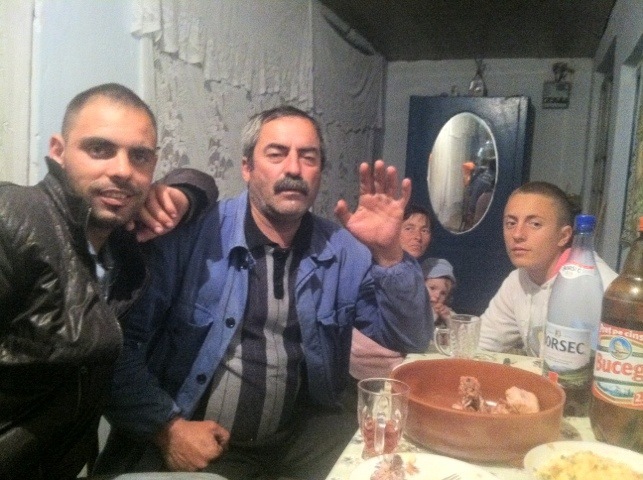 Visiting Costin and Ion, the father/son shopkeepers, was cousin Livru, from Bucharest, 30 kilometers away. By the time the rain stopped I had a friend, and an invitation, in Bucharest. Livru is an entomologist, a mosquito expert working on an international West Nile Virus project; his wife Michela teaches English. After a fine dinner we had a great time around the kitchen table with Livru’s best friend Lucien, a dentist and orthodontist, and and Lucien’s girlfriend Corina, a beautiful dental student. It was my first joke session since England, and I learned a couple of new ones, too raunchy for blogging. In the morning I got a tour of Livro’s office and lab, with Lucien and Corina. I really connected with these guys. Both underpaid professionals, they have travelled abroad and seen how their careers would be elsewhere. Yet they stay in Romania, proud to be Romanian (although not fond of the Romanian government), determined to make their homeland a better place. My hat is off to you, gentlemen. I roamed Bucharest on my bike for a while, dodging showers, admiring the architecture, plazas, fountains and parks. I found some beauty there, but Bucharest needs a facelift, in my humble opinion. Crumbling grey concrete was the motif in many neighborhoods, and the gritty commercial and industrial zones start rather close to downtown. The beat-up busses and ancient trolley cars didn’t help. The people, however, were sharply dressed and friendly, except for the ever-present Gypsies. 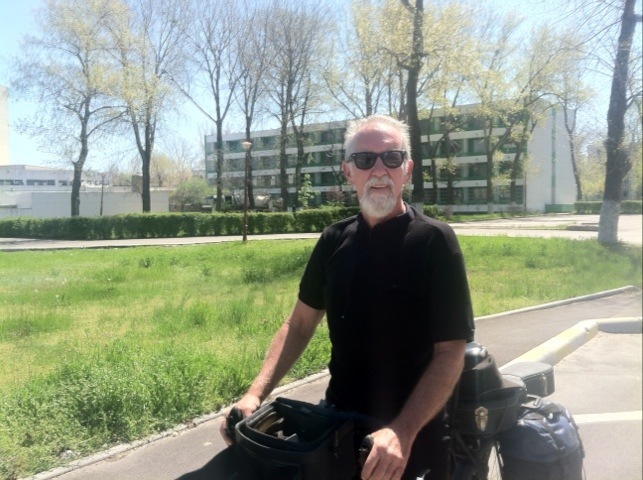 As I left Bucharest the weather changed; the rain stopped, the temperature dropped, and a north wind grew to a gale. For the first time ever, a side wind forced me off the highway. Coming from my left (with a perilous drop-off to a muddy, puddled non-shoulder on my right), it prevented me from keeping to a path narrower than six feet wide. Broken pavement and heavy truck traffic made it even more challenging. After a couple of close calls when a tractor-trailer blocked the wind and sucked me close to the wheels (I mean really close! ), I stopped, at 3:00PM, at a handsome restaurant, only to find they had recently built five nice cabins out back for tourists like myself. I may have been the first guest in number 2, for $32. I cleaned my bike thoroughly, washed my woolens, cranked up the heater and watched a movie. I was so happy. Next day, fresh as a daisy with a clean bike, I found the side wind was now a tailwind. Yahoo! I made nearly ninety miles, despite a late start. In a little town I heard some Yankee accented English at a café. A half-dozen Marines from a nearby base were having lunch. Nice guys (and one gal), we chatted for a while.They were surprised at my choice to travel alone. When a bunch of US Marines call you sir and say they admire your courage, it’s hard not to be flattered. Semper fi. This Kansas-like wheat growing area offers little cover for camping. Tired at sundown, I pulled into a farm with a few trees out back and held off two enthusiastic dogs until Luci rescued me. She pointed me to the courtyard and soon enough to the dinner table and guest room. Good vibes. Vali and Luci and their two kids and two farm hands make a hell of a good life from the land. Forty cows, 70 sheep, lots of chickens, geese, turkeys. Vali doesn’t like pigs. They have a lot of land, a tractor, a horse and wagon they use for work. They sell milk and eggs, chickens, calves and lambs, onions and garlic, hay, flowers and herbs, and they rent land to other farmers. The farm hands get room and board and $133 a month. Room is a bunkhouse with a wood stove and outhouse; board that night was a big sausage and three eggs cooked in the kitchen and delivered to the bunkhouse. (We had lamb stew, greens, bread, beans, dessert, wine—a wonderfully wholesome and delicious meal.) Vali says the bulk of the farm hands’ income goes to alcohol and nicotine. They are strong, healthy-looking specimens nonetheless. Chicks were hatching in the kitchen incubator, yoghurt was kept warm by the stove, and young Ionella washed dishes while I played a couple of tunes. When there is no English sometimes the conversation is limited. Not so with Vali. After a couple of glasses of wine we switched to water. With pen and paper and words I could grasp (Romanian is a Romance language; my Latin and bits of other languages provided some vocabulary), Vali told me about Moscow’s grip on Romania via oil and natural gas prices, how corruption takes a huge percentage of tax dollars, about the soil and agriculture in different parts of the country, about his devotion to the Orthodox Catholic traditions, and lots more. A real fine character, he exuded warmth and cheer, and clearly relished his role as a farmer and head of the family. By the time we were seated for breakfast, he had done three hours of milking and chores. Soon the family and hands were gathered at the gate for a ceremonious farewell. That night, with a storm threatening again, I found shelter at a miserable, dirty, forgotten motel, the only guest, an empty restaurant downstairs with the owners drinking beer and smoking cigarettes. Good wi-fi though, so I got some e-mails and phone calls done. I cooked dinner in the room and fell asleep late. My bank sent me a $10 iTunes gift (for being among the first to use their banking app), so I used it to download some music. I had lost all my music in France in a software update glitch. Next morning, in sunshine, with a tailwind, I listened while riding, something I have never done much. It is enjoyable in moderate amounts. The next day brought me to Constanta. Not the Jersey shore resort I had imagined, it is more like a small Miami. Florentina and Andrei were most excellent hosts, showing me the beautiful, historic city on foot and by bus, and making me feel right at home in their apartment. I stayed two nights, my first layover since Simon and Stane’s in Slovenia. The city is prosperous; fishermen, seamen, and longshoremen make better than average pay, and the resorts, spas and big hotels provide jobs. There are also a couple of universities. My hosts have a lively group of friends, and we joined them for a beer here, an ice cream cone there, and an evening in the waterside park, which was full of families, couples and groups enjoying the warm spring weather. 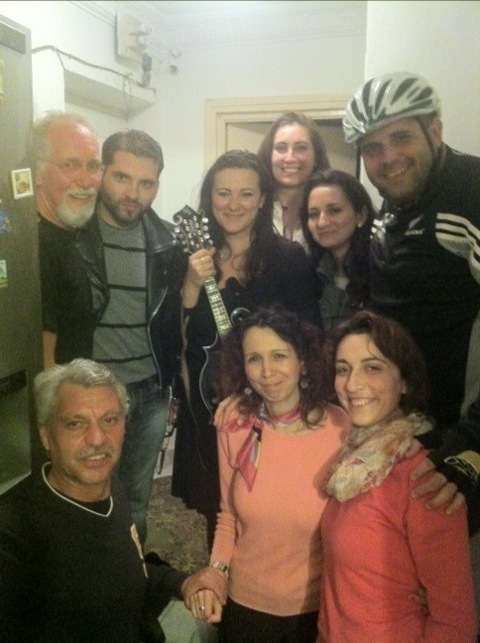 On the second night of my stay, we ordered pizza and beer for an impromptu party. Lovely Laura, her friends Elena and Mihaela, and Florentina all teach English or French. Catalin is the coolest dude I’ve met in a long time, smart and funny. Adrian, a former soccer pro who coaches now, kept the game on TV, even though the girls kept switching to MTV. Dan is a bear, a professional rugby player, and funnier than hell. His girlfriend Diana speaks four languages and studies Greek. Andrei is an economist, unemployed, who hopes to become a seaman. Florentina sent me off in the morning with gifts and kisses and directions to the Russian Consulate. They were no help, and suggested I try the Embassy in Odessa. Which is exactly what I’m going to do. Stay tuned. Keep on keeping on Billy. It is a blast to follow your adventures. Sometimes I wonder why you are so focused on making it to Hong Kong though. If I were on your wheels I might meander more , follow my nose and not a map, and not be so driven to get somewhere in a hurry! But you must have a bargain with yourself to do this trip in a certain time frame. I guess I’d better not complain since I’m just a virtual hitch-hiker on this grand adventure! We would be happy to have you back one day for more days.